When I slapped out the link to the Star Wars Episode VII movie set pics, I did not stop to think that these were more leaked images from egotistically driven, untrustworthy staffers on the set of Disney's new movie. But it seems that they were. And folks who are entrusted on these adventures, prove time and time again that they truly don't appreciate their situation or have this need to be that one who leaks the photos. Though to be honest, sometimes I question the authenticity of a leaked photo, and more often than not, secretly believe a studio "leaked" content, because secret, behind-the-scenes content is so much more exciting to see! Bottom line, it's all good marketing in the end. But the human factor can be so disappointing that leads up to it. 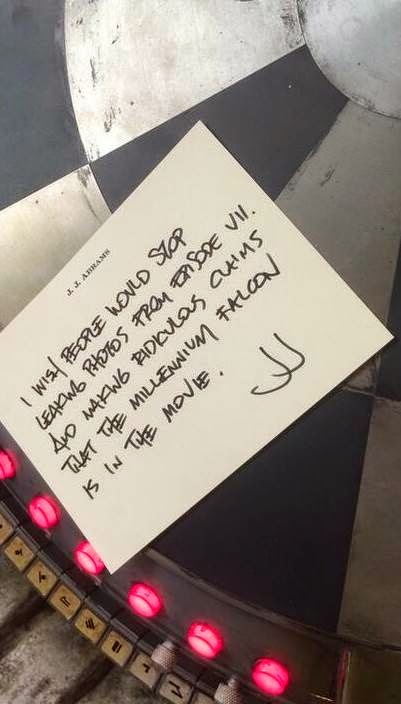 Apparently directory J.J. Abrams let is ire be known by posting an image of a note he wrote. For one, he's trying to dissuade the idea that the Millennium Falcon is in the movie. "I wish people would stop leaking photos from Episode VII and making ridiculous claims that the Millennium Falcon is in the movie." But the picture of the note is hilarious, as it seems he's set the note on a set piece that looks just like holochess board that historically, sits inside the Falcon. LOL. You do the math! >> J.J. Abrams tweet.